Simple and lovely. Colin is a carrot, and Lee is a pea. They're very different, but they are best friends. That's it, and it's gorgeous: diversity in a nutshell. Or a peapod, perhaps. Loved this board book! A fun way of looking at differences between people (or peas and carrots) and how they are valuable because of their differences. Colin and Lee are clearly very different, and difference can be confronting. Colin isn’t described as a carrot inside this book. It is simply pointed out that ‘Colin isn’t a pea.’ Their differences initially seem to limit their friendship, but we are soon shown how embracing ‘other’ enriches us.This is one of the best picture books I’ve come across in a long time, and is certain to be one of my favourites for the year. Its brilliance comes from its simplicity. There are just two colours on the page – vivid collages created from green and orange supermarket carrier bags. The expressions are minimal dot-and-line faces, and the tone switches with the simple turn of a line. The word count per spread moves between just 2 and 12 words. In fact, everything about what we see is engaging but uncomplicated, which leaves plenty of space for the message to seep in… There is an artistry to saying a lot with a little, and Morag Hood does just that with this debut. It’s OK to be different. It’s OK to like different. With kindness and acceptance, we can build bridges (in Colin’s case, as a carrot baton, quite literally. And a fantastic one, too.) This is one of those endearing, fun stories that quietly influence young readers to be better grown-ups, and to like vegetables too if you’re lucky. Radiating humour, charm, wit and warmth, it is truly, truly first-rate. A cute offering focusing on what sets us apart, and what qualities make us special even when we're different. A great pick for a friendship storytime. 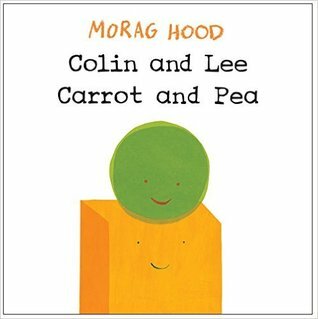 Colin and Lee, Carrot and PeaBy Morag Hood SynopsisLee is a pea. All of his friends are peas; except Colin. Colin isn't a pea.And so begins the deliciously funny story of two very different friends: a small green pea and a tall orange carrot stick. Colin the carrot can't do everything the peas can, but he has some special carrot-y qualities that make him a very good friend to have.All about the beauty of making friends with people (or vegetables) who are different from you, boys and girls alike will love Colin and Lee's clear shapes, bright colours and the playful approach to everyday objects that make this book an instant favourite. Enjoy in this lovely and durable smaller hardback board book format.This book is so cute, its simplistic, colourful and a wonderful look at a very unlikely friendship.